Before reaching Chhuzom, after crossing Isuna village, Tachog Lhakhang also known as Tachogang becomes visible. It is is located on the base of a mountain along the Paro-Thimphu highway. To visit the temple one has to cross the Pachhu (Paro river) using a bridge built with iron chains. The temple houses some unique statues. Tachogang meaning “temple of the hill of excellent horse” was built in the 14th century by Thangtong Gyalpo after he had a vision of the spiritual horse Balaha-an emanation of Avalokiteshvara, while he was meditating. According to myth, he decided thereupon to build a temple at the current spot including one of his famous iron bridges. The original bridge was washed away by floods in 1969 and a traditional style bridge with iron chains was restored in 2005. Thangtong Gyalpo was a great architect who built 108 iron bridges throughout Tibet and Bhutan. 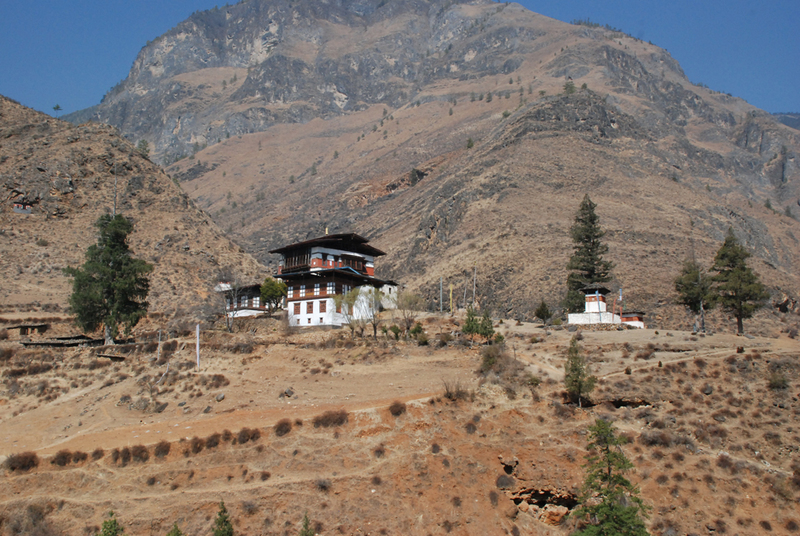 The temple is privately run by the descendents of Thangtong Gyalpo.